Virginia Nyambura. whom most track athletes had not heard of until today, shocked everyone by beating a strong field to win the 3000m steeplechase at the Doha Diamond League. 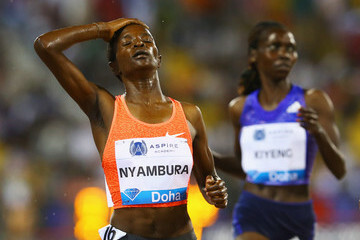 She beat Ethiopia’s Hiwot Ayalew who thoroughly dominated this event least season by only three hundreths of a second. In the process she clocked the fastest time of the season at 9:21.51. The 22 year old Nyambura was a member of the distance medley team that won second place at 2015 world relays championships. It is indeed good news for Kenyans who have lacked a world beater in this event for two years ever. Milcah Chemos who was world champion in 2013 had an injury ravaged 2014 and will likely not return to her world beating form. It was also the only good news for Kenyans at the Doha event. Asbel Kiprop who was expected to challenge for the 800m glory finished 5th in a race that was won by his rival Ayanleh Souleiman of Djibouti. In the 3000m, Thomas Longosiwa was a distance 3rd behind surprise winner Hagos Gebrhiwet who soundly beat Mo Farah to second place. This entry was posted in Kenya Athletics News, Kenya Sports news and commentary and tagged 2015 Diamond League, virginia nyambura. Bookmark the permalink.